It is so quick and easy to make. With just 20 minutes and a handful of ingredients, this soup is ready to put on the stove to simmer. You’ll be sitting down to eat in no time! 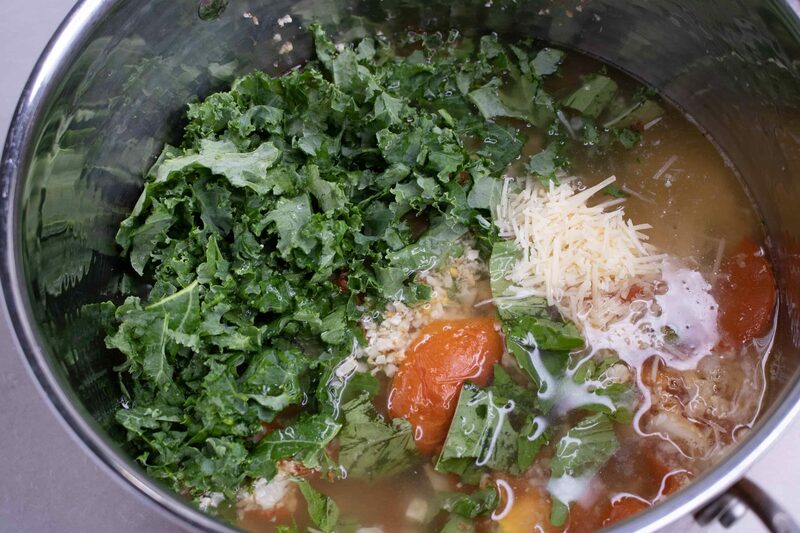 This soup is very healthy as well. It is low calorie (less then 200 calories per bowl), gluten free, high in protein (10.4 grams of protein per bowl) and low carb. 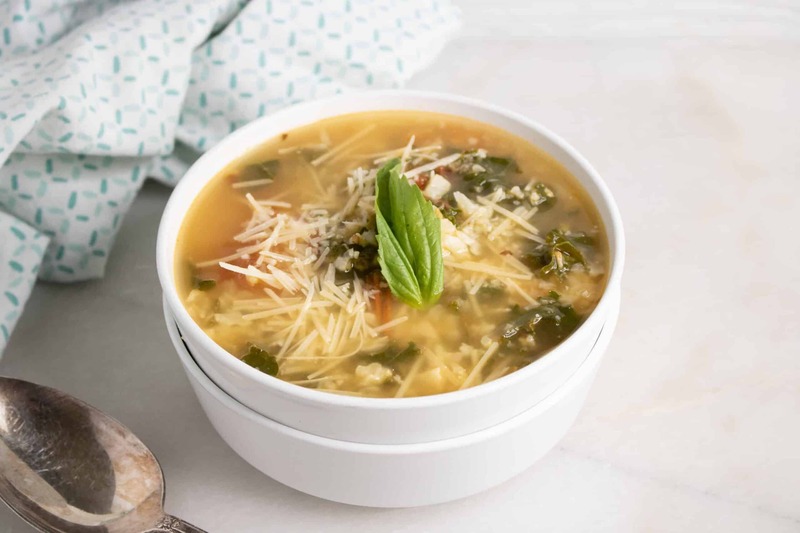 This means that Roasted Cauliflower Rice and Tomato Parmesan Soup is suitable for a wide range of healthy eating styles and dietary needs. 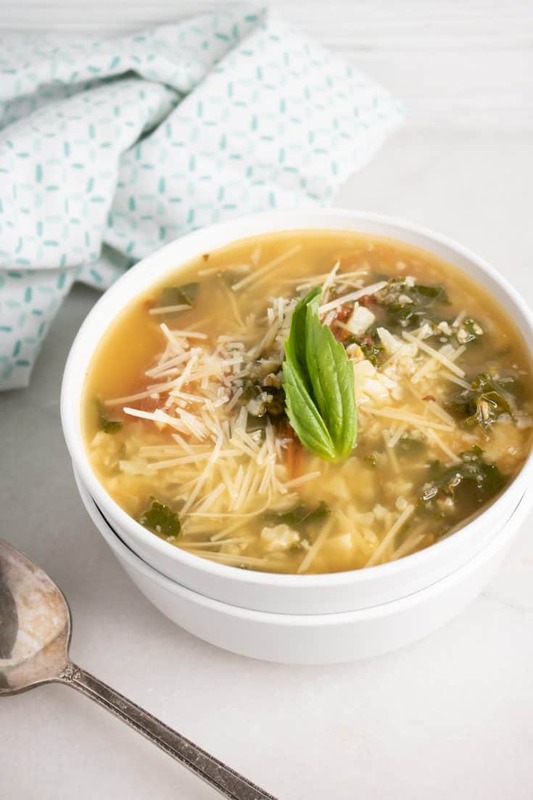 Roasted Cauliflower Rice and Tomato Parmesan Soup is quite versatile. It can be served by itself as a hearty meal, or paired with a main dish. If serving by itself, you can try pairing it with this scrumptious Copycat Macaroni Grill Rosemary Bread. But if you want a more filling meal, try this Honey Mustard Pork Loin or this Easy Pork Chop recipe for a delicious main dish and serve Cauliflower Rice and Tomato Parmesan Soup as a side. You can make it vegetarian. Following a vegetarian diet? Not to worry, there is an easy way for you to enjoy this soup. Simply swap the chicken stock for vegetable stock and you’ve got a deliciously vegetarian soup! Step #2: Brush olive oil onto baking sheet. 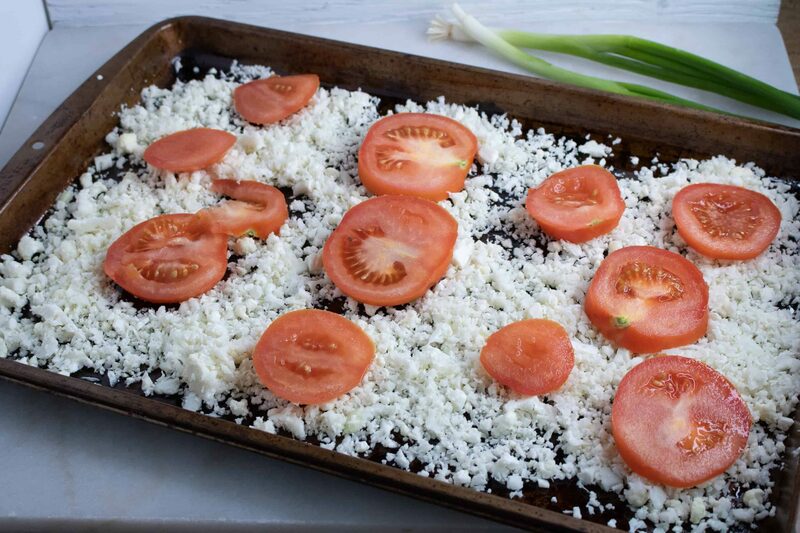 Step #3: Next, roast cauliflower rice and tomato slices on the baking sheet for 20 minutes, stirring halfway through. 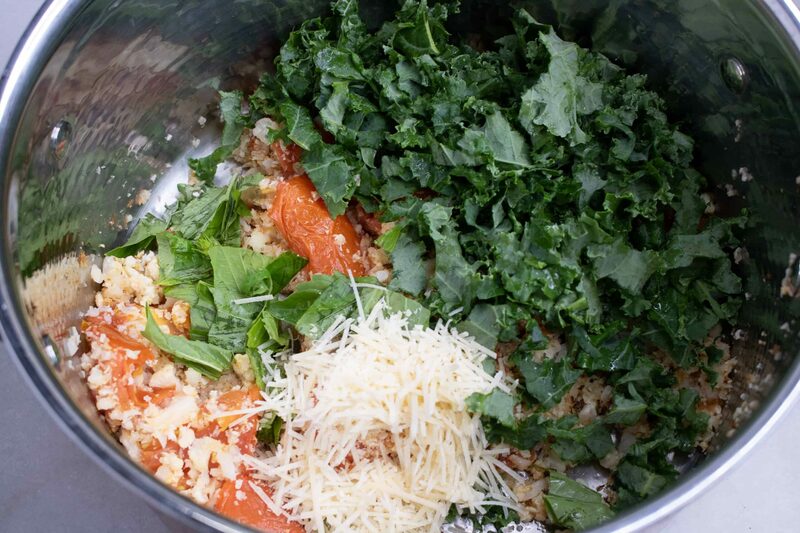 Step #4: After roasting time has completed, add all of the ingredients to a stock pot. Step #5: Bring to a low boil, then reduce to a simmer and cook over medium heat for 20 minutes. 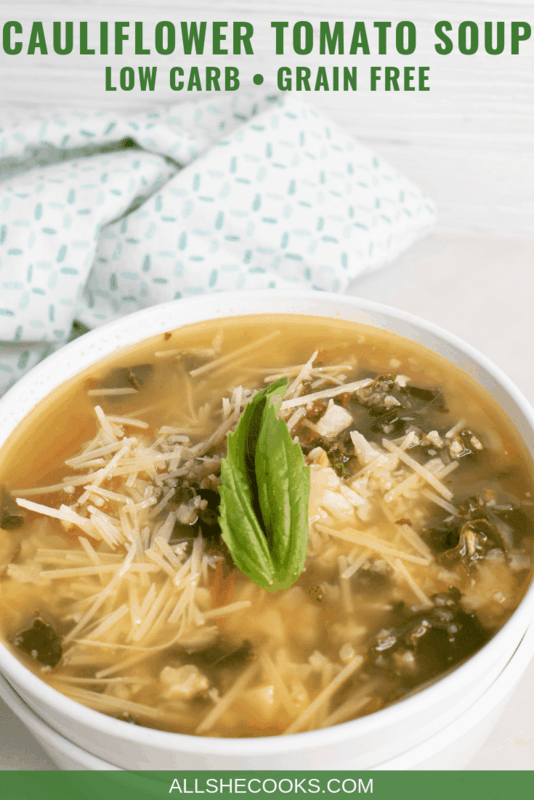 Step #6: Ladle soup into bowls, then serve and enjoy! 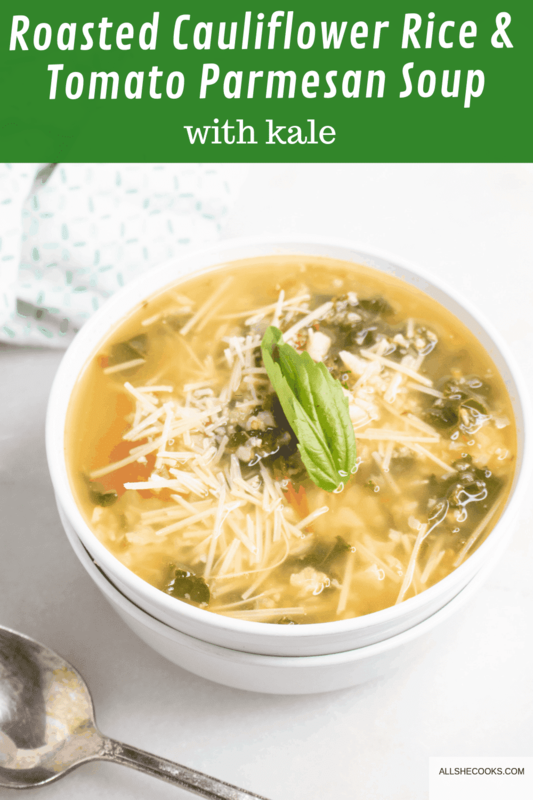 This healthy and hearty Roasted Cauliflower Rice and Tomato Parmesan Soup is so quick and easy to make! Brush olive oil onto baking sheet. After roasting time has completed, add all of the ingredients to a stock pot. Bring to a low boil, then reduce to a simmer and cook over medium heat for 20 minutes. 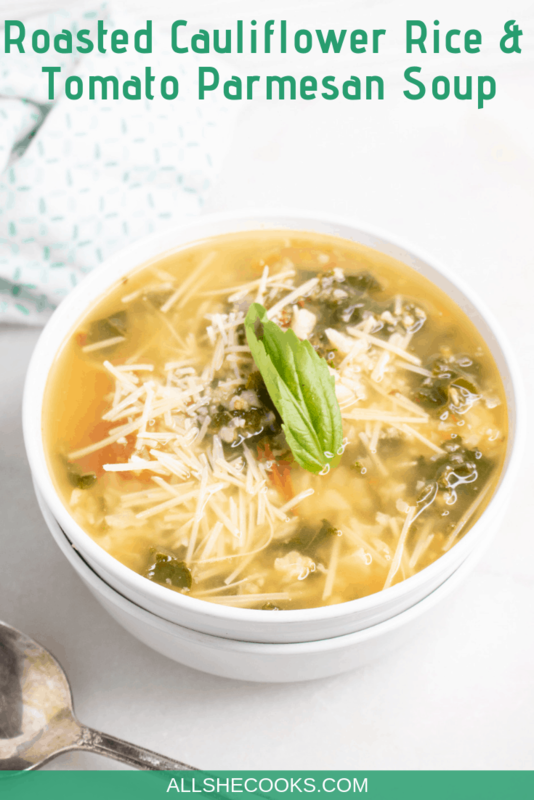 Ladle soup into bowls, serve and enjoy!